The first sequence in A Quiet Place is one of the more immediately tense openings to a horror movie in recent memory. Without fully understanding the world, we understand almost from the first shot what sort of situation we have entered into. The film opens in an abandoned pharmacy, where a family is quietly perusing the aisles for supplies. The family speaks only in sign language, even though only the daughter (Millicent Simmonds) is deaf. It is clear that something bad comes with too much noise, so they don’t make a sound. It’s a completely effective opening to the film. The second segment of the film ends in a similarly tense situation. There are some startling moments that keep us as an audience on our toes about what might befall the family. Then the third segment of the film presents a similar scenario. Then the fourth segment cycles again into the same type of scenario. And so on, until the movie finishes. With each iteration of we-must-be-quiet…oh-no-we-weren’t-quiet, the effectiveness of the situation fades slightly. This is not to say that the film, directed and starring John Krasinski, lacks tension. It has tension in spades. But there is something to be said about the law of diminishing returns. For each set piece, pacing suffers. The set pieces that stand out, however, really do succeed in immersing you. Once we move away from the exquisitely-executed prologue, most of the film’s time is spent on the family’s large farm property. There is a segment of the film where the family splits in half to accomplish tasks in different places, and this sets the stage for what is easily the best sequence in the film. It is also immediately following this sequence—which heavily features Emily Blunt, who turns in another grade-A performance—that the movie starts getting repetitive. The script does a fairly good job of writing itself around this feeling of repetition. The scenarios change slightly and get more cautionary as the film progresses. It is how certain beats are telegraphed with the camera that makes the scenarios feel less fresh as time goes on. Complications that are introduced have conclusions that are not hard to foresee. The characters in the film are ones that we root for. We are given explicit reasons to care about them and their internal struggles inside the family dynamic. And all of the actors do a find job portraying them, particularly given the absence of speech. The script also benefits from focusing on this set of characters. The world outside of the family is almost unseen. The isolation that is bred from this not only grounds us in the family’s lifestyle but also helps bolster the tension. The major issue with A Quiet Place, if you can call it an issue, is that it makes itself vulnerable with its storytelling choices. For example, the family must remain virtually silent if it wants to survive, and thus every bit of non-diegetic sound is much more blatant. Marco Beltrami’s score is fine, but it also takes away from the silent tension. More egregious are the false jump scares that use music stings. While this technique is often used in the horror genre, it sticks out even more here because the silence is germane to the narrative. The choice to tell a story that involves so much silence is a bold one for a thriller, but it doesn’t always work in the film’s favor. 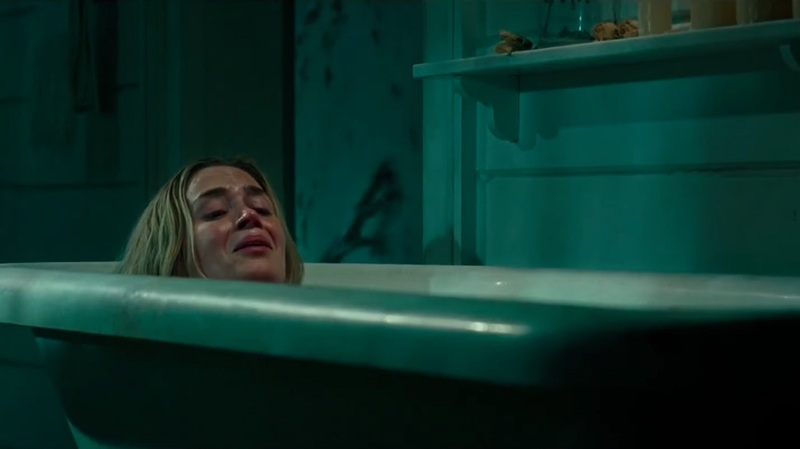 Ultimately, A Quiet Place has multiple tense sequences that are bound to be memorable. It has a cast that brings life to its characters, which feels like a miracle in an industry climate where most major studio horror films don’t even bother giving their characters any sense of individuality. And it has an intriguing gimmick. It also has a repetitive plot segmentation that diffuses the tension and drags the pacing. In a horror-thriller that relies on tension and pacing, this is a pitfall best avoided.